I know I'm only 12, but I've been against keeping wild animals in captivity my whole life. Elephants shouldn't be chained in the circus, gorillas shouldn't be behind bars or in glass enclosures at zoos and orcas shouldn't be forced to swim in endless circles in swimming pools. I think that these are things that kids just know. And when I saw "Blackfish" and learned how SeaWorld tears baby orcas away from their families -- and how orca families are so close that mothers will cry and mourn their missing babies -- I was horrified. I have the best mom and dad in the world, and I can't imagine being separated from them just so a theme park can sell tickets, but that's exactly what SeaWorld does when "baby Shamu" is promoted as the new arrival. "Blackfish" showed me that I needed to do even more than simply refusing to go to SeaWorld's parks. I knew that SeaWorld was going to have a float in the Macy's Thanksgiving Day parade, so I signed up to join PETA's protest, and I was happy to stand on the sidelines with other protesters with my "Boycott SeaWorld" sign. When I finally saw the SeaWorld float coming down the street with a depiction of orcas in their natural habitat, I couldn't believe it. Nothing about that float told the truth about how orcas are held captive at SeaWorld. I pictured kids like me across the country seeing the float on TV and, not seeing us protesters or knowing how orcas die prematurely at SeaWorld, telling their parents that they want to go to see the orcas there, and I was so upset. I felt like I needed to do something. So I decided to climb over the barricade with my sign to let everyone know that SeaWorld is a sad place for orcas. The police officer who stopped my solo protest and walked me back to my mom said that I ruined the parade, and that totally made my day -- I had succeeded in getting my message across! 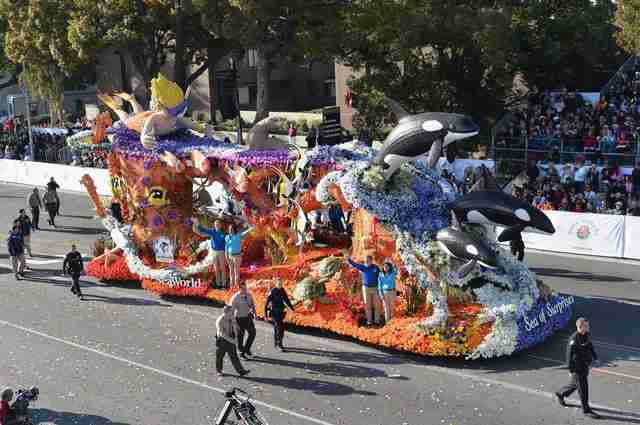 Photo: Getty Images SeaWorld has been pretty desperate since "Blackfish" came out, so they also decided to have a float in the Rose Parade in Pasadena, and I knew I had to be there for that, too. It just seemed to me that a family event like the Rose Parade is THE LAST place where we should celebrate an animal-abusing corporation like SeaWorld that actually rips families apart. So I flew across the country to join with fellow activists and PETA supporters to protest. We wore shirts that read, "SeaWorld Hurts Orcas," and held signs calling for a boycott of SeaWorld, and as the parade got underway, we sat down in the street in front of the SeaWorld float, stopping it from moving. I heard later that throughout the parade, the route was lined with spectators who booed as SeaWorld's float went by and held homemade signs calling out SeaWorld's cruelty to animals. It was so great to realize that I was far from the only person that day who stood up for the orcas, dolphins and seals living in small tanks just two hours south of where we were protesting. I ended up spending several hours at the Pasadena Police Department by myself, separated from the adult protesters (including my mom). The police were really nice, but as I sat there wondering when I would get to see my mom again, I couldn't help but think about how the animals at SeaWorld will never be reunited with their families. Their separations are for life, and their captivity will be for life unless we can all come together and convince SeaWorld to release the animals to seaside sanctuaries and definitely stop breeding the animals they have.I know that when I'm an adult, SeaWorld as it is now will no longer exist. I envision a company that rehabilitates and releases injured and sick orcas, dolphins, and other marine mammals somewhere safe -- somewhere that lets visitors watch remotely, without the animals knowing, and then enjoy rides or music or whatever the park has to offer that no longer hurts animals. That's the future. 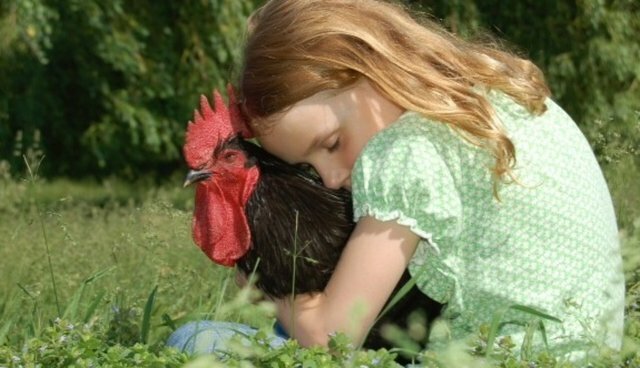 I look forward to that, and I can't wait to look back on this time and realize that I was part of a movement that changed things for animals for the better. And anyone can be part of this movement: All you have to do is refuse to go to SeaWorld and encourage your friends, family, teachers and classmates to do the same. Get started by visiting SeaWorldOfHurt.com.